A Venus-Jupiter Epoch (close) conjunction occurs 443 days after the last conjunction of these two bright planets shown in the image above. 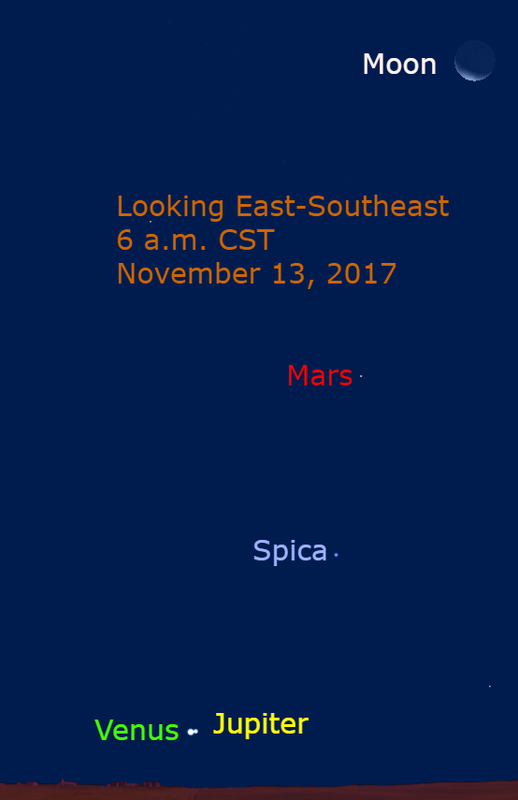 This conjunction occurs just before sunrise on the morning of November 13, 2017 when the two planets are about 0.3 degrees apart. This article outlines the circumstances of conjunctions between Venus and Jupiter, the events of this conjunction, and concludes with a list of future Venus-Jupiter conjunctions. Conjunctions of the bright planets occur when they appear to move past each other in the sky. Sometimes they seem to nearly meet, although they are millions of miles apart. A Venus-Jupiter conjunction occurs between 34 days and 449 days, depending on the relative positions of the three planets (this includes Earth). Venus revolves around the sun once in about 225 days. Because our planet is moving, Venus catches up to and passes by Earth every 584 days. Jupiter is a slower moving participant in this celestial waltz as it revolves around the sun once in nearly 12 years. Venus is always visible near the sun as it is closer to the sun than Earth. From our planet it never appears more than about 47 degrees from the sun. When it is east of the sun, it appears in the western sky just after sunset. When it is west of the sun, it appears in the eastern sky, just before sunrise. Jupiter’s movement in the sky largely follows the earth’s revolution around the sun and mostly reflects the annual westward advancement of the starry background. Jupiter first makes a morning appearance in the eastern sky, just past conjunction when Jupiter is on the far side of its orbit behind the sun. Each week it appears higher in the sky and farther west at the same time each morning. Several months later, it appears in the western sky just before sunrise from this slow westward celestial migration. At this time it is at opposition with Earth between the sun and Jupiter; they are on opposite sides of our sky. At this time, Jupiter rises a sunset, appears in the south at midnight and sets at sunrise — appearing in between at other times during the night. Jupiter continues to rise earlier each week, eventually appearing in the south at sunset. As Jupiter heads for conjunction (behind the sun) it appears in the western sky at sunset, eventually setting with the sun. This entire cycle takes 399 days. Because Venus’ orbit is inside Earth’s orbit, Venus never appears more than 47 degrees from the sun, the Venus-Jupiter conjunction appears within region of the sky when Jupiter is near conjunction. Additionally, if the Venus-Jupiter conjunction occurs too close to the sun, the planets are hidden in the sun’s brilliant glare. In recent times, 75% of the conjunctions occur when Venus and Jupiter are very close to the sun. 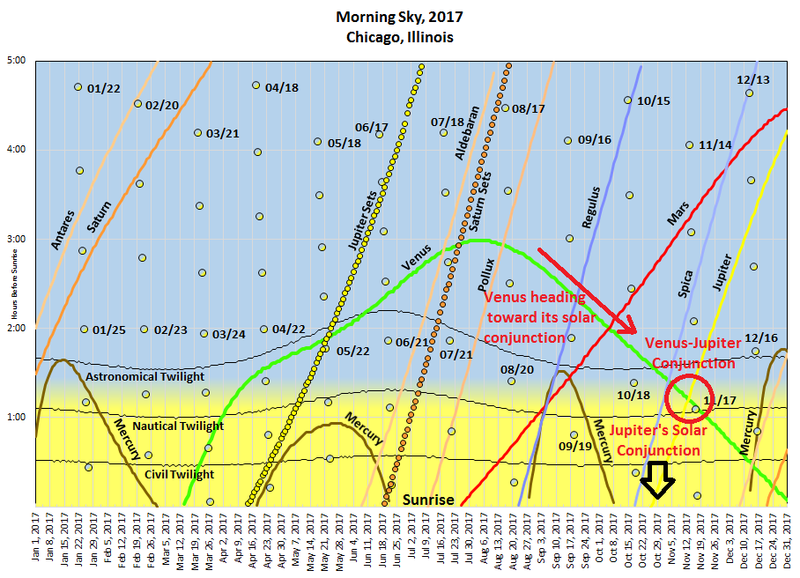 From the above chart notice that Venus is a brilliant Morning star for most of 2017. During the autumn it rises closer to sunrise than it did in summer. It is heading toward its superior conjunction with the sun on January 9, 2018. Jupiter reaches its solar conjunction on October 26, 2017. It is behind the bright sun. Jupiter slowly emerges into twilight and then begins rising before morning twilight begins. The November 13th conjunction occurs during twilight. It is not impossible to view. Two factors are important: Having a clear eastern horizon and viewing the pair before the sky grows too bright. The pair is only 14 degrees west of the sun and 5 degrees above the horizon, making the view a little tricky. Unlike other recent Venus-Jupiter conjunctions, showing events leading up to the conjunction are limited by Jupiter’s solar conjunction that occurs only 18 days before this epoch meeting. Further Venus is headed for its solar superior conjunction and rapidly plunging into the solar glare. Our lead-up and follow-up descriptions are limited by the sun’s glare. The views on the charts below are 40 minutes before sunrise, 6 a.m. CST in the Chicago, Illinois region. Check your location for the sunrise time and look for the planetary pair 40 minutes before sunrise. Brilliant Venus and bright Jupiter shine from low in the east-southeastern sky. The pair is only about 5 degrees above the horizon. Venus is twice as bright as Jupiter. 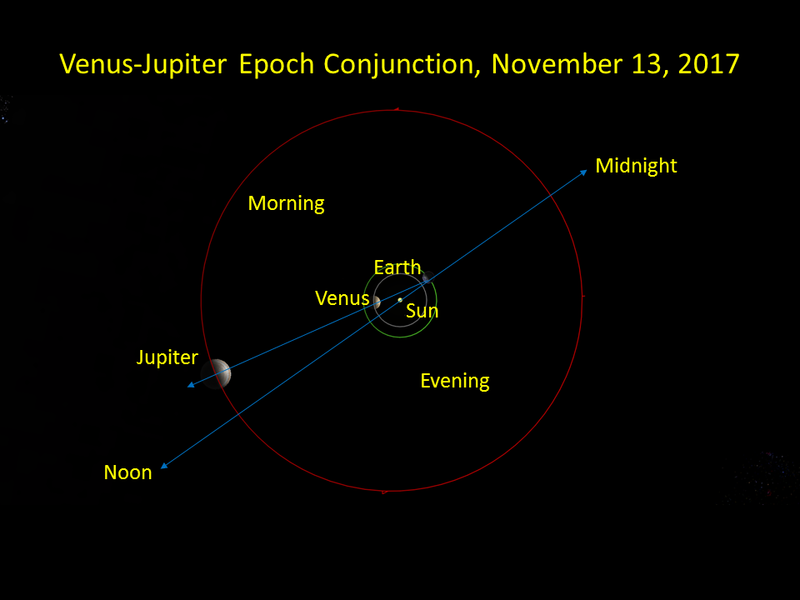 On the morning before the conjunction, November 12, Venus is slightly less than one degree above Jupiter. Spica is nearly 13 degrees to the upper right of Venus; Mars is 23 degrees; and the moon is 55 degrees above Venus. This chart shows the relative sizes of the planet orbits for the conjunction. The sizes of the planets have been exaggerated to see them. The angle the planets make with the sun is only 14 degrees making them appear low in the eastern sky. At the time of the conjunction, Jupiter is nearly 4 times farther away than Venus. On conjunction morning, the pair is still very low in the east-southeastern sky. They are about 1/3 of a degree apart! 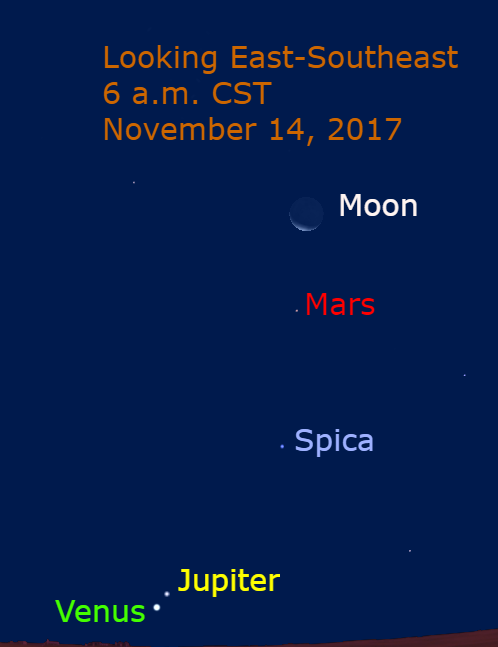 Spica is 13.5 degrees to the upper right of Venus; Mars is nearly 24 degrees above Venus; and the moon is 43 degrees above Venus. Through a telescope, Venus and Jupiter appear in the same field of view. 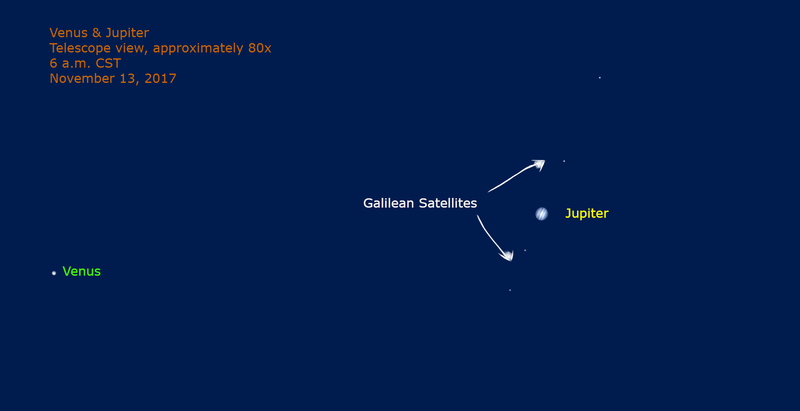 The Galilean Satellites, the four large moons, line up with Jupiter’s cloud bands. Two appear above Jupiter and two below. Depending on the optical configuration of the telescope, Venus is visible to the side of Jupiter. 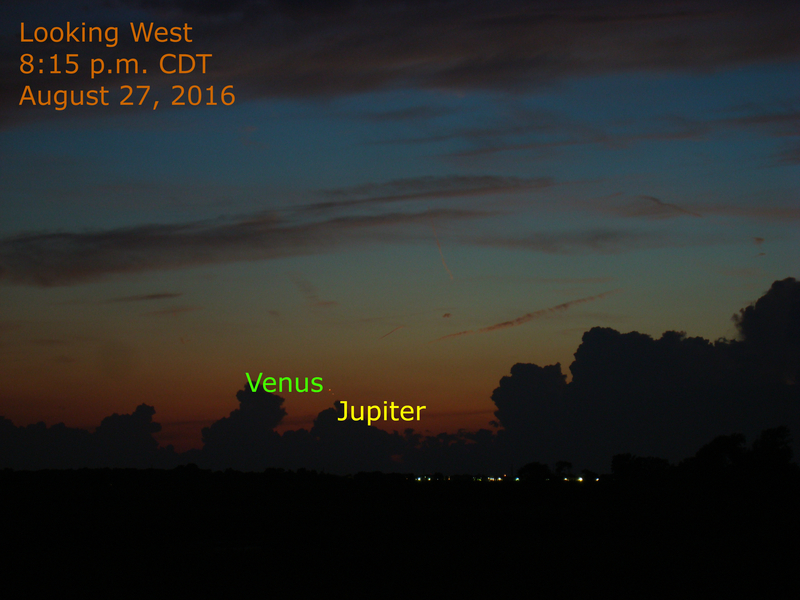 On the morning following the conjunction, Venus and Jupiter are over a degree apart. 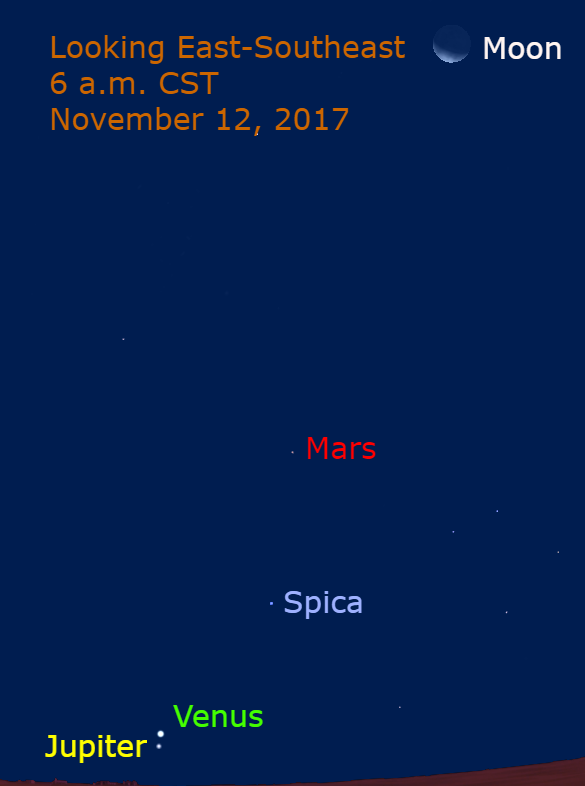 Spica is 14.5 degrees to the upper right of Venus; Mars is 24 degrees above the bright planet; and the moon is 31 degrees above Venus. The moon is 11 degrees above Mars. Update: Venus 1.4 degrees to the lower left of Jupiter: November 14, 2017. The table below shows the next 6 Venus-Jupiter conjunctions. The February 2025 event rival this conjunction in separation. Following the conjunctions mentioned on this list, a close conjunction (28′) occurs on August 23, 2038 followed by a closer conjunction occurs on November 2, 2039 (13′). Other more widely spaced Venus-Jupiter conjunctions (30′ to 2 degrees) occur in the interim. The planets in this widely spaced conjunction are far apart visually, but easily seen as they rise about 3 hours before sunrise and appear in low in the southeastern sky as morning twilight begins. The planets in this widely spaced conjunction are nearly 3 full moon diameters apart. They are visible low in the southwestern sky during twilight and early evening, setting about 1 hour, 35 minutes after sunset. This pairing is very difficult to see in the eastern sky as the planets rise in bright twilight just 25 minutes before sunrise. The planets rise in the eastern sky about 90 minutes before sunrise. In separation, this rivals the June 2015 conjunction, although it is lower in the sky. This conjunction rivals the June 2015 pairing, with the planets high in the west after sunset, setting 2 hours, 30 minutes after the sun. May 23, 2024 15’ Morning This pairing is impossible for casual observers to see as it occurs when the planets are nearly behind the sun hidden in the solar glare.